Flexible space, convenient location and great service. 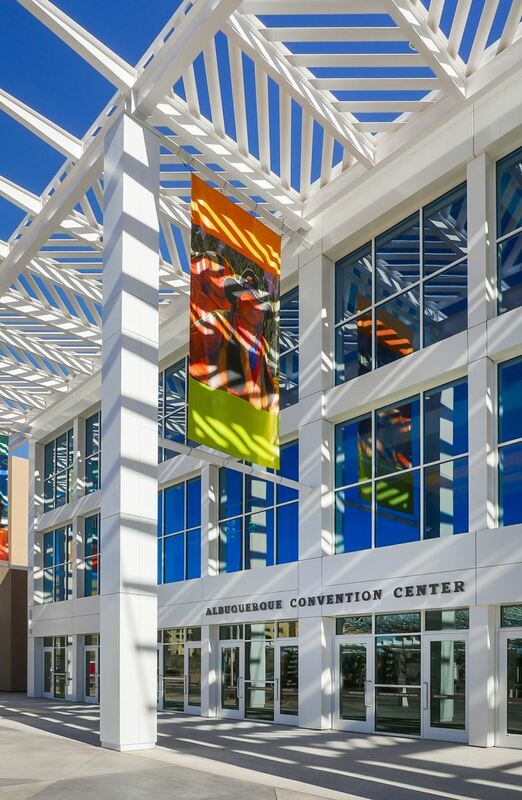 It all adds up to the Albuquerque Convention Center being the perfect place to do business! The ACC’s centralized location in the heart of downtown is just a short walk from 900 hotel rooms, restaurants and entertainment options. Albuquerque is easily accessible via air offering non-stop service to some of the nation’s top hubs including Denver, Dallas, Atlanta, Los Angeles, San Francisco, Chicago and the Washington DC area. Once on the ground it’s just a quick 10-minute drive from the Albuquerque International Sunport to the ACC. For those attendees driving to Albuquerque, Interstate’s I-25 and I-40 meet just two miles away from the ACC, offering easy access for out-of-town visitors. Our facility offers over 167,000 square feet of exhibit space featuring the Northeast and Southeast Exhibit Halls that provide 106,200 square feet of contiguous, column-free space. The ACC has 27 flexible meeting rooms, which can hold an intimate meeting of 10 people or a large breakout for 1,100. Our amazing 31,000-square feet Ballroom lends itself as a magnificent banquet space for up to 1,800 people or an impressive general session area for 2,500 attendees. The crowning jewel of our facility is the 2,300-seat Kiva Auditorium. The Kiva is the perfect space for any general session or a keynote speaker. The ACC Event Services staff is here at your service to ensure that you have a successful event. Our professional and courteous Event Managers will be there to assist you throughout the event planning process. Just consider us an extension of your own event team!